Very early in the development of our website we knew our visitors needed a little help sorting through the clinical evidence on hyperbaric oxygen for a wide range of diseases and conditions. Maybe a lot of help. For most clinical indications we found a dearth of reliable information on the web. For some off-label indications the medical literature strongly supported further research and investigational use of hyperbaric oxygen therapy. For others the clinical evidence was weak (scant) or totally lacking (none). Enter the Evidence Index. HyperbaricLink's at-a-glance summaries provided a handy reference to the state of clinical evidence on HBOT for many diseases and conditions. We also provided links to the published medical literature and other analyses and commentary, so you could check out our sources and do your own research. Approved — HBOT indicated and widely reimbursed. 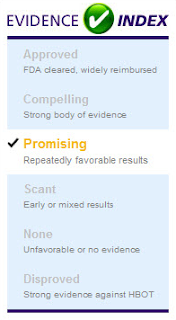 Only FDA-cleared and UHMS-approved clinical indications earn this rating. Compelling — Strong body of evidence supporting evidence-based practice. A select few off-label hyperbaric oxygen therapy indications merit such interest and encouragement. 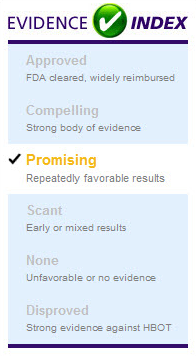 Promising — Repeatedly favorable results urging further study. Hyperbaric oxygen therapy has demonstrated real promise for just a handful off-label diseases and conditions. Scant — Early or mixed results with lingering questions. We find scant evidence for the majority of off-label indications for hyperbaric oxygen therapy. None — Unfavorable results or no published evidence. HyperbaricLink is unlikely to publish pages on diseases and conditions for which there is no published evidence on HBOT. Disproved — Strong evidence against using hyperbaric oxygen therapy. Null findings in the hyperbaric medical literature have not yet eliminated any diseases or conditions from further clinical investigation. We look at a broad range of medical literature in scoring our Evidence Index, but we don’t give every paper equal weight. Some studies are better designed and conducted than others. Some clinical investigators and healthcare institutions are more influential than others. Some medical journals are more highly regarded than others. Look for more information about how we read and evaluate scholarly articles in the medical literature and popular stories in the mainstream health media in our forthcoming white paper on Evidence-Based Hyperbaric Medicine. Truly, it's a labor of love, a love of the Scientific Method and of the ever-advancing knowledge and understanding that inform modern hyperbaric medical practice.